I have been writing about the indifferent attitude of union leaders towards a common banker and their nexus with top management. I am sure, most of the union sympathizers must have dubbed me as Anti-union, as Anna Hazare has been dubbed as anti-Parliament. However, inspite of this knowledge, I will continue to write about the need for bringing a REAL CHANGE in the thinking and attitude of the union leaders, almost similarly as Anna Hazare is continuing his movement inspite of the fact that all MPs passed a resolution against him and his team mates. All this because I myself being an ex-banker, can feel the pain of the banker working in a remote branch. Most of the bankers must have noticed the recent controversy regarding over 60 years old cartoon relating to Dr Ambedkar. All of a sudden, the whole Parliament erupted and Mr Kapil Sabil, now notorious about his comments of zero loss in 2G scam, jumped to apologies on behalf of the government. (Till date he has never apologised for loss of Rs 1,76,000 crores in 2G scam). The whole episode left me baffled as to the state of affairs of Indian Netas. I was so shocked that I could not find words to express myself. Finally, I came across the following cartoon which appeared alongwith an article in Times of India on 20th May, 2012, which relieved me for searching the words to explain the status of our netas. I express my gratitude to the cartoonist for such a wonderful expression. On 21st May, 2012, Unions gave a call for Protest Day and now they are giving a call for 2 Day Strike in July, 2012. In a separate article by Mr Jain on this website, we have dealt in detail about the issues which needs to be tackled for the welfare of the bankers and for improving the health of the banks which are 'rozi roti" of the bankers. However, instead of taking those serious issues, they have launched protest against trivial issues and will soon spend lakhs of rupees on posters and other preparations to make happy their political bosses. However, they are not ready to finalise the demands for Xth Bipartite Settlement, 2nd Pension Option denial to a group of bankers inspite of so many court decisions. They do not want to talk about National Litigation Policy about which I have recently written on this website. In the given circumstances, what should bankers do ? This is the right time to ponder upon as discussions for Xth Bipartite are still far away from concluding stage, and union leaders need support of the cadre to keep the pot boiling for their political bosses as next Lok Sabha elections are not far away. There is a need to take a pledge that you will not support union leaders for any flimsy and useless emotive issues. Support them fully and go on long strikes if needed to get your due share of higher salaries and updation of pension for the retired bankers. Ask union leaders to be transparent in talks with IBA and management on various issues. 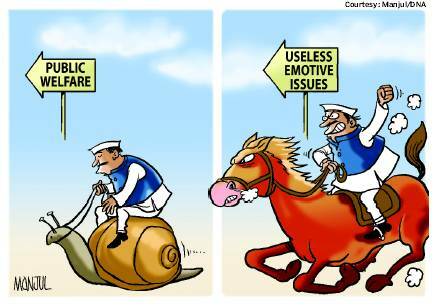 Show the above cartoon to your fellow friends to impress upon that there is no need to charge on "useless emotive issues" of petty HR issues or computerisation or outsourcing. Every banker is aware that inspite of all their efforts, union leaders have not been able to thwart computerisation. If there is a need for outsourcing, it will certainly come, and no kind of protest can stop them. Hundreds of protests and strikes were done by unions against computerisation, dilution of equity etc., but they could not do anything in this regard. Can any union leader has the courage to publish the list of all the protests and strikes undertaken for various issues (except wage revision), and the follow up agreements concluded with government on these issues in last 15 years or so. They have hardly anything to show. Therefore, I am of the firm opinion that bankers should refuse to support the unions on these petty issues and ask them to protest and strike only on real issues. In the end I would like the bankers to ponder on these issues and create awareness among the fellow bankers and friends so that bankers too can get their due share like the central government employees. I hope this message will spread among the bankers and they will have brighter future. If necessary bankers should think of stopping the monthly subscription to unions, most of which is wasted in travel and 5 star stays.